Paris, Éditions du Seuil, 2018. Elem Klimov’s apocalyptic master piece of 1985 “Come and See” (Requiem pour un massacre in French), one of the very few films about war deserving the epithet “anti,” begins with two ragged boys digging up an abandoned assault rifle in a sandy wasteland, while a German reconnaissance plane, drone-like, passes overhead. Readers of Masha Cerovic’s brilliant new book on the Soviet partisans of the Second World War may be reminded of this scene for several reasons. Most immediately because Klimov’s cinematic depiction of the atrocious brutality and deep suffering of the war between Nazi Germany and the Soviet Union of 1941-1945 – the Great Fatherland War in Soviet and much Russian terminology – focuses not on great battles fought by regular forces, such as Moscow, Stalingrad, or Kursk, but on the same partisan war of relentless guerrilla tactics and vicious counterinsurgency that Cerovic addresses – fought to a large extent (but not exclusively) in parts of today’s Belarus. But also because Klimov’s artistic imagination happened to illustrate some of the insights now produced and presented by Cerovic in what is bound to become an indispensable key work on the Soviet partisans. Thus, indeed weapons on battle fields left behind after the rapid yet ultimately failed German onslaught of the summer and fall of 1941 constituted, Cerovic shows, one important source of partisan armament and, for the German invaders, one of the two major unintended cost of their reliance on rushing ahead Blitzkrieg-style – the other one being the scattering of Red Army soldiers in their wake who would play a central role in the partisan movement. More generally, there is the partisans’ sense of witnessing – and fighting through – an apocalyptic catastrophe brought by a truly infernal enemy that Cerovic identifies as a key attitude among them, conveying it in depth and probing for its consequences with great acuity. Cerovic’s book is outstanding in the existing literature – and of course in conversation with Kenneth Slepyan’s very important study – not merely due to its broad and appropriately multi-lingual sources, but, much more importantly, because it combines a modern, thoroughly post-Cold War approach of great methodological sophistication with a rich, highly productive, thoroughly post-Soviet source base. Put differently, it’s the ideal – and by no means inevitable – outcome of the “archival revolution” triggered by the end of the Soviet Union, where the availability of fresh sources has met a historian using them in a truly fresh way. Among these sources, one that deserves special mention is a collection of hundreds of partisan testimonies taken by Soviet historians during the war. Against the backdrop of Soviet postwar policies to strictly regulate and manipulate the public memory of the war, these invaluable documents were not used for Soviet publications and have only recently been rediscovered. It is Cerovic’s exemplarily astute and sensitive reading of these materials and her consistent ability to leave old stereotypes – popular as well as academic – behind that makes her work akin to Jochen Hellbeck’s similarly insightful exploration of comparable testimonies from the Red Army soldiers who fought at the battle of Stalingrad. Taken together, these two innovative works now establish a new benchmark for writing about the history and contexts of both the war of the regular Red Army and that of the partisans, while also making important contributions to the more general question of how to think about Soviet society as a whole by focusing on the war. In this respect, Masha Cerovic’s study also substantially enriches and expands the field established by comparatively recent trailblazing studies, such as by Lisa Kirschenbaum, Olga Kucherenko, Amir Weiner, or Karel Berkhoff. In her careful attention to the partisan imaginary, Cerovic’s study is also in conversation with works on Soviet subjectivity, by authors including Karen Petrone, Jochen Hellbeck, Malte Rolf, and David Hoffman, to name only a few. In sum, Cerovic’s book is about the Soviet partisans of World War Two, but, while often providing the reader with deep, almost micro-historical explorations of this topic, it is also about much more. Like the best studies of specific places, phenomena, or groups, it speaks to issues far beyond its immediate subject matter. In this very real sense, this is a book about the Soviet phenomenon, in its Stalinist iteration, through the case of the partisans. One important strength of Cerovic’s modus operandi is her unflagging rejection of misleading dichotomies, simplistic narratives as well as insufficiently searching counter-narratives. In their stead, the author never fails to offer a sophisticated analysis. Thus, she takes care to explain that her account offers what we can call a double revision of the existing literature on Soviet partisans. Like other serious scholars, she understands the official Soviet narrative of a broadly popular partisan movement efficiently directed by the Communist Party as a myth serving multiple political purposes – to hide and offset the Nazi-Stalinist collusion of 1939 to 1941 as well as the Soviet near-defeat of 1941, to re-assert the authority of the Soviet leadership, and to integrate different parts of the Soviet Union. Yet she also rejects any simple inversion of this myth, a narrative in which the Party and the authorities are anything but helpful yet still take center stage. Instead, she focuses on “an unstable structure shot through with rivalries and conflicts at all levels” and a temporary but distinct partisan world that has its specific way of life, death, and waging war. Moreover, regarding the omissions and biases that serve to create historical myths, Cerovic is clear about the Soviet ones, while also pointing out, in passing, as it were, that the Soviets did not have a monopoly on politically or psychologically reshaped memories. We also learn that Moscow’s practice of sending emissaries – either by land or air – did not come with any neat distinction between, on one side, local partisans and, on the other, professional agents and commandoes: even among the latter were many “volunteers trained in a hurry” (72). In her discussion of the relationship between the Communist Party’s officials and the partisans, Cerovic’s shows us not only that tension, deception, and distrust were rife. She also makes two further, crucial points: Partisan commanders who resisted supervision and control by the Party were not thinking of themselves as rejecting Soviet Communism and they were not interested in “democracy” or other laxities – the infamous “partisanshchina” – either. Nonetheless, both these attitudes only increased the potential for conflict with Party representatives. In a similar vein, the partisans’ “seminal violence” against those they saw as traitors appears as not neatly guided by a “formal definition of collaboration.” Yet, Cerovic shows us, it was not arbitrary either: the category of the “traitor” itself was complex – combining behavior under Soviet occupation as well as local tensions, including opportunistic and false denunciation. Seen with a wide lens, Stalin’s children, Cerovic shows us, were a comparatively homogeneous community. In the ethnic and national terms that the Soviet Union treated, shaped, and reinforced as nationality, Partisans were much, indeed preponderantly more likely than not to be young, male, and Slavic. Moreover, while there were widespread general stereotypes about “Ukrainian treason” and collaboration with the Germans, Cerovic has found no evidence of this idea leading to discrimination within the partisan units: being seen – and declaring oneself – as Belorussian/Belarusian, Ukrainian, or Russian de facto meant belonging to by far the largest, one is tempted to say the default nationality bloc among the Soviet partisans. Things were different for all others – “the borderline ran between Slavs and non-Slavs” (100) – but in different ways: Cerovic doesn’t fail to point out that in regions not at the heart of her research, such as Crimea, non-Slavic ethnic communities repeatedly ended up as “scapegoats” (66) for Partisan failures, with brutally vindictive consequences. Jews constituted a group that was treated as an especially other Other. 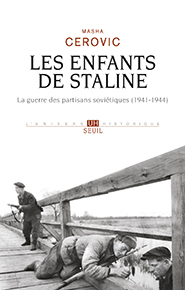 Cerovic confirms what we know from research into Soviet wartime attitudes in general and partisans in particular: the Holocaust did not feature as an important issue or challenge in partisan thinking or self-perception, even while they were “perfectly aware that the Nazis were applying a policy of total extermination of the Jews” (100). Tens of thousands of Jews fought among the partisans in general, insofar as they were accepted, as well as in their own units, but they encountered very little, indeed in Cerovic’s view no sympathy because of their victimization by the Germans. Indeed, they encountered hostility instead. Quoting a young Jewish journalist and partisan originally from Moscow, she sums up the partisan attitude: it was the “hostility toward the Germans and the Nazis” that curbed the partisans’ violence toward the Jews. It was not the Holocaust that condemned Nazism in the partisans’ eyes. Instead it was their condemnation of Nazism that made it difficult for them to accept the Holocaust (101). Using her source base with great efficiency to escape the force fields of both official Soviet and German views of the partisans, Cerovic highlights two things: first that the war of the partisans was special, diverging substantially from what the Soviet central authorities wanted and from what the Germans were capable of imagining or understanding. Secondly, that the special features of the partisans’ way of war exerted strong, at times at least even preponderant influence. Thus, where Soviet authorities may have preferred a narrower focus on attacking and impeding the Germans, the partisans developed and stuck by an intense drive to kill those whom they considered traitors and collaborators among the occupied population. This also entailed deeply intimate violence, including parricide, massacres of collaborating police – whether armed or prisoners – as well as families, and villages, holding whole communities collectively responsible, which Cerovic discusses with the requisite detail and directness. She offers us a detailed description and complex assessment of this insistent, not – as she makes clear – exceptional, brutality by, essentially, focusing on the logic of an apocalyptic kind of warfare imposed by the German terror, in which the Germans figured as an absolute but clearly recognizable enemy, while the partisans imagined traitors as at least equally heinous but, in addition, as defiling, pestilential, and contagious to a Soviet community in need of (yet more) purging, literally by fire and sword – or, to be precise, hatchets and knives. Cerovic interprets this behavior as both semi-detached from Soviet discourse, in that it does not rely on “the theoretical apparatus of Marxism-Leninism,” and deeply Soviet in that it displays a profound attachment to a Bolshevik political culture understood more broadly. She is certainly right, and her work here makes an original and important contribution to the general advance in our understanding of Soviet attitudes or subjectivities that we have seen since the 1990s. It also speaks directly to work, such as by Amir Weiner, that has taken seriously the Soviet citizens’ and subjects’ capacity and need to make sense of both their struggles and their suffering, even under extreme duress and when Soviet authority was shaken by devastating war, within a Soviet framework but not without agency. Where some readers will disagree with Cerovic is not about the fact that partisan warfare had an exterminatory, violently “purifying” aspect, but about her interpreting it as targeting its victims “nature” in a “biological” frame of mind. Here, her work here certainly makes a commendably explicit contribution to another important issue: in how far can we understand Soviet, especially Stalinist violence as ethnicized? She shows with great effectiveness that the partisans’ idea of traitors was informed by categories such as vermin and even lineage. Yet this reviewer still sees a need for further debate in this area. At any rate, Cerovic is commendably clear that the partisan violence she depicts, in all its brutality, does not bear comparison with either Nazi extermination policies or the pogroms and massacres of the Ukrainian ethno-nationalists of the OUN and the UPA. Stalin’s Children is much richer than this review can reflect. It is a book nobody interested in the history of the Soviet Union, Stalinism, World War Two, and mass violence in general should fail to read carefully and from cover to cover. This reviewer hopes that it will be translated at least into English. See Jochen Hellbeck, Die Stalingrad Protokolle. Sowjetische Augenzeugen berichten aus der Schlacht (Frankfurt/M: Fischer, 2012) and the English edition Stalingrad. The City that Defeated the Third Reich (Public Affairs, 2015).